The items below represent matters the ‘working group’ and primarily the Road Trip Participants, Juliet, Clare, Suzie, Matt and myself identified as priorities as a result of the Roady trip and some internal review of the gardens current operations. The task for the ‘working group’ next year is to prioritise the order of tasks/projects and assign/volunteer for responsibility of the same. Items have been given basic assessment of planning and organisational requirements or in some cases e.g. signage, could be executed with post haste with minimal effort/planning i.e. low hanging fruit. Although these may not be priority items perse, they may early attention due to the apparent ease of execution. This document will form the basis for the discussion and carriage of works and associated planning to begin in January next year for task identified in this document and resulting from another session scheduled for next year in which oversights and assignment of tasks can be addressed. It is envisaged these projects/operations will be adopted by small project groups/pods for the duration of the associated project(s). It is envisagde these groups/individuals will be given parameter guidance by the Committee in terms of approaches/costing and than given responsibility to execute plans with support as required. A project team/pod to form and identify necessary signage requirements for the garden. Identify and execute opportunities for art. This project(s) will appeal to artistic and creative persons to develop a range of low cost directional and interruptive signs. This may require the building of some information kiosks where assistance will be required. how to put a proposal up to committee for consideration. A small group to formulate requirements for seed saving and execute requirements. These were a feature of several over community gardens. This is potentially a revenue raiser for CRGC. Requires a small project team to investigate and report on feasibility and approach. These activities were a feature of several other community gardens. Most gardens didn’t seem to charge much for these services but it did give a greater dimension and membership appeal to a broader range of people. Requires a small project team to investigate and report on feasibility and approach. This is likely something that will happen in conjunction with a planned presentation to Council early next year (February/March) regarding the Garden’s progress and support requirements from Council (i.e. paid Coordinator role). This will coincide with a invitation to Council Directors to have a conducted tour of the garden. Some of the requirements we will present to Council will be initiated by investigations of items in this document. These were a feature of several over community gardens and a means by which such members as the African Community may be interested. Requires a small project team to investigate and report on feasibility and approach. These were a feature of several over community gardens. These appeared to be good revenue opportunities (See Northey St’s use of cylindrical metal barrels used to make bulk compost and Southport’s commercialisation of compost making) . Requires a small project team to investigate and report on feasibility and approach. These was a feature of Northey St. Perhaps a longer term plan for us but one that we should include in medium term plans to be reviewed annually for feasibility to ensure eventuation when appropriate conditions prevail. There is already a initiative at CRCG to upgrade the nursery via a grant. Once the outcome of that application is known we should review our operating standards and quality control etc. These were a feature of several other larger community gardens and would be worthwhile investigating to understand the pros and cons. Requires a small project team/individual to investigate and report on feasibility and approach. These were a feature of several other larger community gardens. This is potentially a revenue raiser for CRGC. Requires a small project team/individual to investigate and report on feasibility and approach, and potential presenters and frequency of same. Develop a list of preferred service suppliers that can be proudly displayed and supported by the garden and provide a potential discount to members shopping with sponsors. This was a feature of Northey St and would be worthwhile investigating to understand the pros and cons. Requires a small project team/individual to investigate and report on feasibility and approach. It is envisage this venture may provide additional funding for a coordinator and extra labour to maintain and expand the existing garden. This is a feature of several other community gardens and would be worthwhile investigating on how we might provide such an attraction and the various permissions/precautions we need to take. Requires a small project team to investigate and report on feasibility. Offer an ‘add-on’ service for consultancy in a range of horticultural services. Requires a small project team/individual to investigate and report on legal, commercial, lease agreement, methodology, qualifications aspects of this proposal. These would be over and above the Ambassador Tours Arlan is already conducting. The proposal includes approaching local groups and clubs etc to understand what type of customised tours they might like. Requires a small project team to investigate and report on feasibility and suggest requirements. Lismore community garden had a covert “Nature loo” composting toilet… Apparently costing only $200.. This could be another option for a 2nd and composting toilet facility. Requires a small project team to investigate and report on feasibility and suggest requirements. Develop a comprehensive management policy for plot holder’s responsibilities re care of their plot e.g. rotting fruit and dereliction of plot procedures. We have borrowed a version based on the Yamba garden policy and this needs to be reviewed before adoption. Requires Committee to review/adapt and adopt. As part of this program of suggested tasks in this document identify long term goals that can be implemented and budgeted for now, to ensure implementation rather than relegation. Once we have settled on projects priorities in per this document develop budgets and funding methodologies to match. Requires an executive team to address once this process of project analysis is ratified. It was noticed in other community Gardens how important pathways were in the garden for the development, navigation and personal journey in a garden. Requires a small team to identify what pathways we can develop now, using what material and in what timeframe, budget, report and execute. It was noticed that in Mullumbimby CG there guidelines clearly displayed for members to follow if they have an initiative they wished to offer to the association. We can adapt and adopt these guidelines. Requires an individual to copy/adapt and present to Committee. Ensure an easy access for members to escalate concerns to avoid more complicated processes required to resolve issues. Small team to investigate and formulate guidelines and present to Committee. It is apparent that areas such as Plot Holder Responsibilities require clear policies. A small team is required to identify what other areas require further policy development/plan of management review e.g. Animals in the garden, Issue escalation processes (e.g. bullying), use of manures etc. The larger gardens have funded positions to coordinate activities of various types: As part of presentation to Council (envisaged around Feb- March 2013) regarding our status and what assistance we need from Council, we should include the need for at least one paid coordinator. The CRCG should forts explore means of financing, supervision, direction, duties etc. Requires a small team/individual to investigate and report to Committee initially. This is really reinforcing the previous statements that all Committee executive positions and potentially co-ordinators positions require two persons to have knowledge of role to able effective handover/support as required. Your feedback and comments are welcome and appreciated!! Please respond via our conatct page.. The day will be jam packed full of events, food & fun! Its going to be hot so bring your water pistols along! 11am – 12noon Buzz and friends, the kids will love it! 12.30 pm Christmas Lunch from our Woodfired Pizza oven! 1.45pm Buzz and friends, Return afternoon performance for the kids! 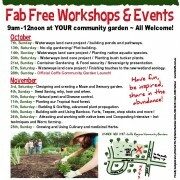 Come along and have a good look around Your community garden!! Sunday the 7th- Waterways land care project / building ponds and pathways. Saturday the 13th, – No-dig gardening/ Plot building. Sunday the 14th, – Waterways land care project / Planting native aquatic species. Saturday the 20th, – Waterways land care project / Planting bush tucker plants. Sunday the 21st, – Container Gardening & Food security / Sovereignty presentation. Saturday the 27th, – Waterways land care project / Finishing touches to the new wetland ecology. 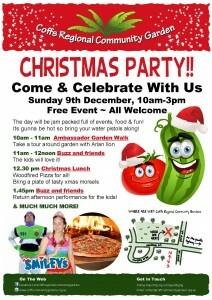 Sunday the 28th, – Official Coffs Community Garden Launch! Saturday the 3rd, – Designing and creating a Maze and Sensory garden. Sunday the 4th, – Seed Saving, why, how and when. Saturday the 10th,– Natural pest and Disease control. 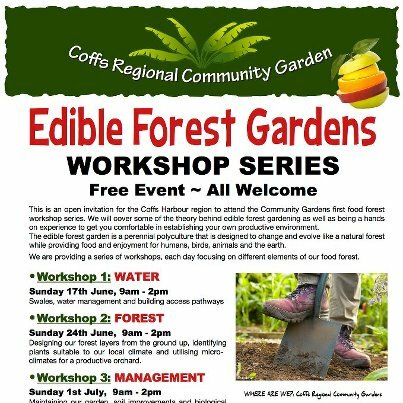 Sunday the 11th, – Planting our Tropical food forest. Saturday the 17th, – Budding & Grafting, advanced plant propagation. Sunday the 18th, – Using Bamboo in the garden, followed by warm-temperate Tree planting. techniques and Worm farming . Sunday the 25th, – Growing and Using Culinary and medicinal Herbs. All workshop start at 9am.